Maharishi Markandeshwar University, Mullana - Ambala ,Comprising ten of its teaching institutions, as “Deemed University”. MMU has developed another over 40 Acres new vibrant Campus at Sadopur on Delhi-Chandigarh National Highway in the suburbs of Ambala towards Chandigarh. 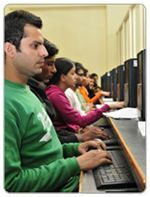 The afresh campus at Ambala (Sadopur) boasts of research oriented facutly from Ivy leauge colleges of country.Well euipped labs & workshops .Library stocked with latest books,national & international journals.E-resources with paradigm infrastructure an eventual centre of excellence of Professional education. The constituent institutions of the University are MM Engineering College; MM Institute of Computer Technology & Business Management (MCA); MM College of Dental Sciences & Research; MM Institute of Physiotherapy & Rehabilitation; MM Institute of Computer Technology & Business Management (Hotel Management); MM Institute of Medical Sciences & Research; MM Institute of Management; MM College of Nursing; MM College of Pharmacy; and MM Institute of Nursing, Mullana, Ambala. These institutes are also approved by the regulatory bodies like Medical Council of India, Dental Council of India, Indian Nursing Council, Indian Association of Physiotherapists, All India Council for Technical Education etc.